Submarine assigned to assist with chaser crew training. "Naval Attache Rome, cabled that Italian Government had placed Italian submarine Nautilus at our disposal for instruction purposes." (From: War Diary, Naval Base 25.) As the heat of summer wore on in Corfu, the submarine chaser crews were still training in the new science of antisubmarine warfare. To help the crews learn to use the listening devices more effectively, an Italian submarine was assigned to serve as a training target. The submarine would travel along a planned route, and chaser crews would report direction findings. 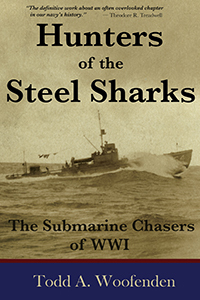 Photo: From Hunters of the Steel Sharks: The Submarine Chasers of WWI, by Todd A. Woofenden.